5 startups that pitched at Ecosummit conferences in the past celebrate new funding rounds. Within 3 days, 9 hours and 52 minutes electric aviation pioneer E-volo raised €1.2M in a record-breaking crowdfunding event on Seedmatch. Just in time, the Karlsruhe-based cleantech startup managed the first unmanned flight with the prototype of their green Volocopter VC 200 (see video below). Ecosummit contributed €1K and joined a group of 750 fearless crowd investors that agree that this worldwide innovation is ready for take off. With the help of E-volo Seedmatch established firmly as Germany’s leading crowdfunding platform for startups having raised over €10M for 50 projects since August 2011. Finally, I find a bit of time to highlight some recent investment deals in our smart green ecosystem. 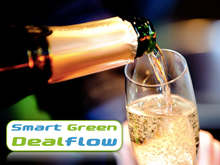 We plan to write our Smart Green Dealflow more often, so please keep sending us your cleantech deal press releases. This time we cover High-Tech Gründerfonds (HTGF), Better Place, Epyon, Heliospectra, Tiramizoo, Compositence, Novaled and Proterra. These companies all work on the future of mobility and LED.